We absolutely love the British summer when it’s hot and sunny – it’s just a shame that it never seems to last long enough! With so many sun protection products out there, it can be hard to know which is best for you and your family. That’s why we’ve pulled together this handy little guide to the best sunscreens so you can have fun in the sun, for longer! The most important thing to consider when choosing a sun protection product is the SPF rating. SPF stands for Sun Protection Factor and it’s what protects your skin from burning as a result of the sun’s UVB rays. The higher the SPF, the longer you’ll be protected for in the sun. For example, if you usually burn after 10 minutes in the sun without sunscreen, wearing an SPF30 will protect you for up to 300 minutes, or 5 hours. Check out the table below for a rough SPF guide. We’ve mentioned that UVB rays cause sunburn, but did you know that it’s the UVA rays that cause long term skin damage and premature ageing? Always look for sun protection with a maximum five-star rating against skin damage caused by UVA rays, then you can lie back and relax, knowing that you’re getting the best protection available. Our sun protection range offers effective UVB and five-star UVA protection, and we now show the protection level on the front of the pack so it’s easy to see. And the great value means it won’t burn a hole in your pocket! Are sprays superior or are lotions cream of the crop? The best thing about sun sprays is that they’re easy to apply. They also help prevent your hands getting greasy from rubbing cream in. Our clear sprays are quick drying and ideal for sports and being active in the sun. Great for people that are less likely to smother themselves in sun lotion, our clear sprays help provide the protection you need in the sun. Lotions and creams tend to be more hydrating, which is good if you’ve got dry skin. While the ingredients are likely to be the same in sprays and lotions, some people may not use as much of the spray as they would the lotion, making it less effective. Should you opt for sensitive? If you have sensitive skin it’s important to choose a sun protection that won’t cause any irritation. 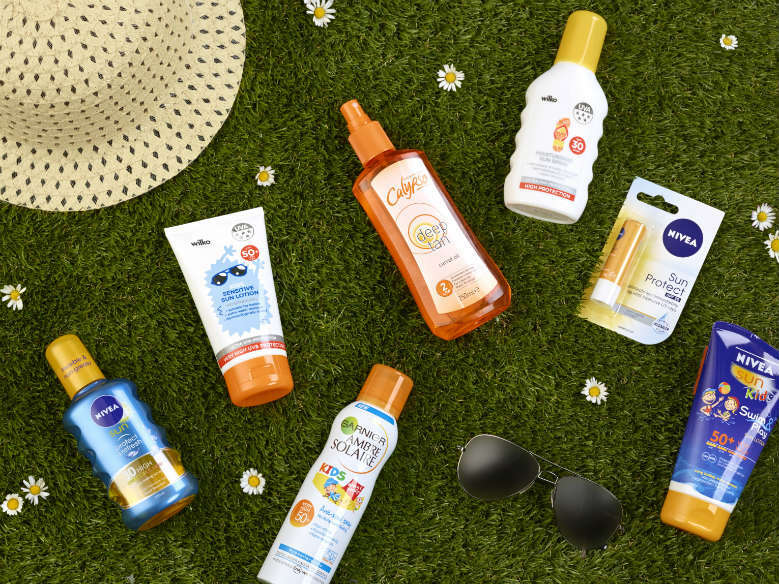 Choose carefully and you can enjoy your time in the sun knowing you’re giving your skin the best possible protection at the same time as reducing the risk of sun-induced allergies or rashes. We’ve developed a sensitive range by taking out ingredients which can cause irritation and allergies and making sure the formula moisturises the skin. Dermatologically tested and approved, the range is available in SPF30 and SPF50 and is free from colour, preservatives and fragrance. If your face is sensitive you can double up on sensitive sun cream with anti-inflammatory ingredients which won’t cause you any issues. Generally, sun protection for children uses an extra sensitive formulation which is ideal for your child’s delicate skin. You’ll find products are often extra water resistant and dermatologically tested – meaning little ones can play longer in the water while you have the reassurance that they are still protected. Our Kids Sensitive Sun Lotion SPF50+ provides a very high level of protection, as well as being fragrance, preservative and colour free – it’s even suitable for babies! Our fantastic suncare range features a variety of sunblock products to suit you and your family, providing effective UVB and five-star UVA protection… all formulated to smell like holidays! Whichever sun protection product you use, make sure you use it properly. Try and apply your suncare product 30 minutes before heading outside to give it enough time to soak in. Make sure you’ve covered every inch of your exposed skin, even the tricky bits! Reapply every couple of hours, or more often if you’re swimming or sweating. Shop our full sun care range at wilko.com and keep your skin protected from the sun!